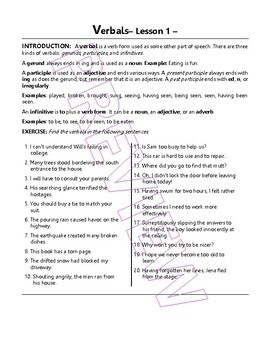 ✶ This grade 7 and grade 8 resource contains 20 Grammar Lessons; spread throughout 43 pages, with full answer keys about THE PHRASES; the Prepositional Phrase, the Appositive Phrase, and the Verbal Phrases; Infinitive, Gerund, and Participial Phrases. It is ideal to explain, practice, and review the main skills of each topic with your students. ✶ This resource is written in a simple and plain language; which makes it easier to get underachievers back on the track as well as address individual differences among your students. This resource is also very suitable for homeschooling. Lesson 1: Introduction to Prepositions, Object of Prepositions, and most commonly used prepositions. 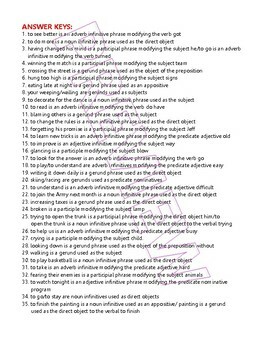 Lesson 4: More practice on the Gerund and the Gerund Phrase. Lesson 5: The Infinitive as a Noun. Lesson 6: More practice on the Infinitive as a Noun. Lesson 7: The Participle and the Participial Phrase. Lesson 9: Combining Sentences Using the Participial Phrase. Lesson 10: Writing Sentences Using the Participial Phrase. Lesson 13: The Verbal Phrase Review.